An outdoor kitchen doesn't have to be just your imagination. 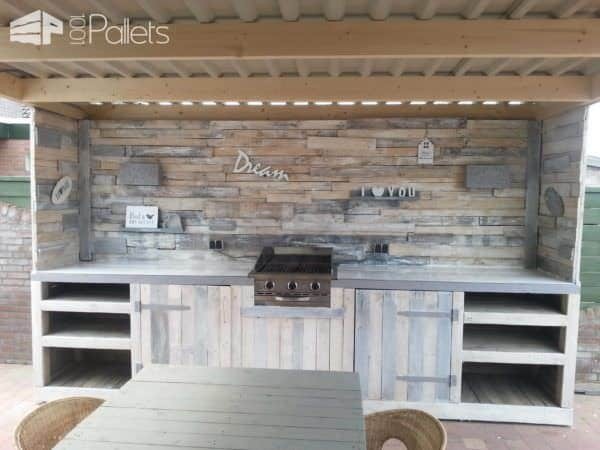 With pallets, you can make your own Pallet Outdoor Dream Kitchen! 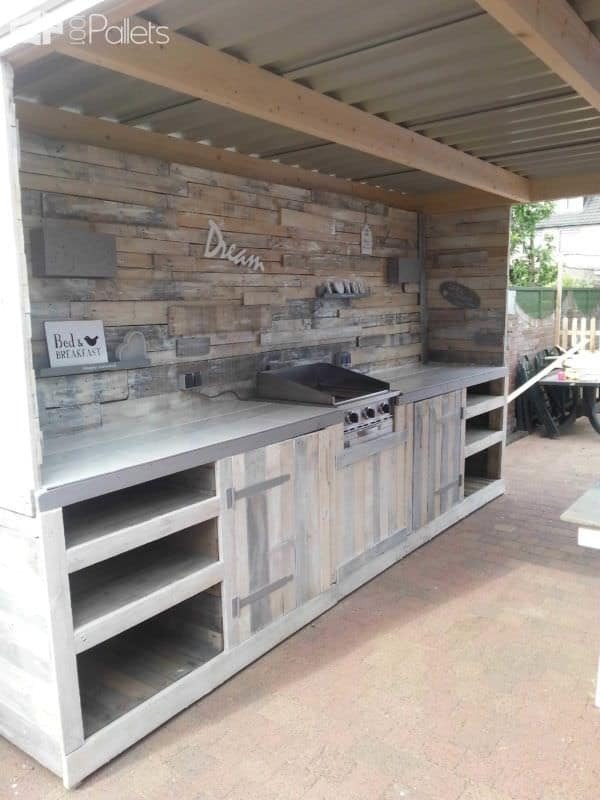 This kitchen is 4 meters (13') wide and made of recycled scrap pallets. First, we built the frame for the cabinets. I didn't supply the dimensions because this fits our house, and may not fit yours. We cut the stringer boards and framed the cabinet unit out, creating shelving with the deck boards.  Next, we created two doors for dining and grill supplies, but you may need to plumb for a propane tank. We framed them out only using deck boards to keep them light. We cut the deck boards to length and used two scraps for the boards to screw to. Next, we installed long, decorative hinges. I had taken the photos before we installed the knobs. Hooks and eyes may be another option, and the ones with the little spring latch will keep nosy pets and young children from quickly accessing the barbecue tools. We framed out a sturdy countertop and used some cement backer board. This allowed us to install a tile surface. We did the tile work as one of the last steps. We created a bit of shade and wind block by making the side pieces. These were deck boards that we mounted vertically on the outside, and then did another layer of decorative floorboards on the inside. Then, we whitewash-stained the entire thing to keep the gorgeous tones but gave it a bit of a beach feel We installed several different shelves, and some wall sconces then put up a few different inspirational signs that represented our family. The area over the grill was covered with corrugated roofing to provide extra shade. 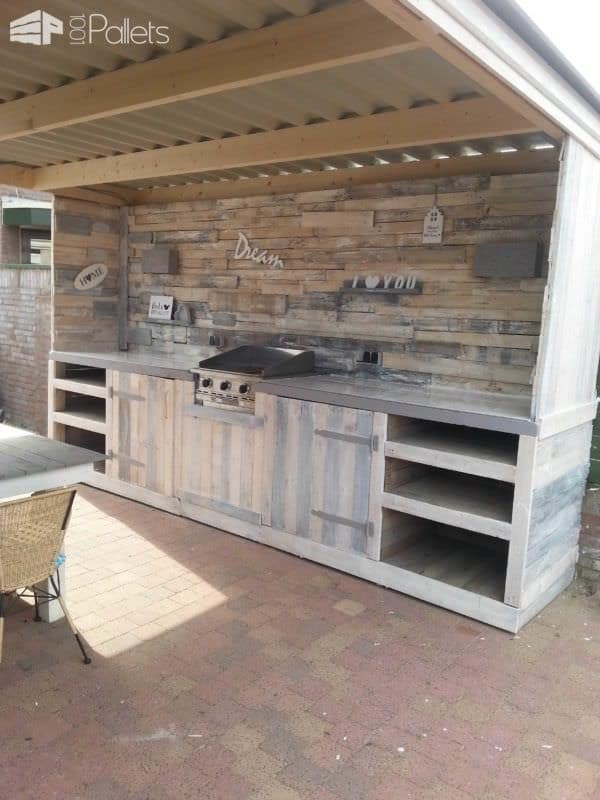 We love our Pallet Outdoor Dream Kitchen and urge you to go out and make your own! If you need help to dismantle your pallets to take apart the boards, here is an article that will present you several ways of dismantling a wooden pallet. More information on preparing your pallet before painting is available in this article. If you are searching for more ideas, don't miss these 20 outdoor kitchen ideas! Are there no plans for this? I don’t see plans posted or linked anywhere… or am I just blind? Kameron Perkins wow the ultimate! Does the wood get hot where the grill is? Looks really nice. You bring up a good point, Rudy. There are fire-proofing coatings that you can either paint on or soak materials in before installation. SAFETY FIRST for sure! Happy Palleting – HS. j adore c est trop beau ca donne envie ! ca dois etre genial quand on invite des amis a manger ! les bon barbecue l été !! super des plant son til dispo ??? Top comme cuisine d’été dans une grande villa! Ok.. I have heaps of pallets… who can help me make this???? Jorge Stein HERE YA GO!